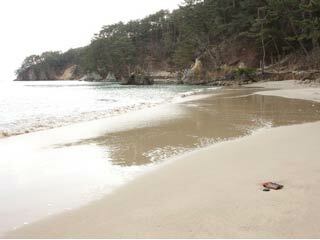 Kugunari Beach (十八鳴浜) is one of the beautiful beaches in Oshima, Kesennuma. The size of this beach is about 200m long. It was the first registered sound beach in Japan. When you walk on this beach, it will make very unique sound. The sound itself became the name of the beach. This beach is very important for academic research. Never leave any garbages, and keep it neat and clean. When the sands are wet, they don't make any sounds.